Like Noreen and Emily Bazelon and every other liberal woman on Twitter, I listened to Michelle Obama last night, hoping that she would at least acknowledge her professional background. And I sighed when she declared: “My most important title is mom-in-chief.” I well understand the joy and responsibility that comes with parenthood. But I also know that the word “mom” only begins to describe Michelle Obama and millions of other women. However, in the light of day I’ve come to a different conclusion: We need to lay off Michelle Obama. First of all, even though I suspect she didn’t volunteer for the role, the first lady has spent much of the past decade focused on her kids and on her husband’s political career. With Barack first commuting between Chicago and Springfield, then Chicago and Washington, and then jetting around the country, somebody needed to raise their girls. Grandma Robinson is always in the wings, and has helped bring up Sasha and Malia. But Barack spent the better part of his childhood with his grandparents and has talked about how he resented his mother for ceding parenthood to them. As much as any other factor, Michelle Obama made it possible for her husband to become the first black president, and not in a clichéd “behind every successful man is a strong woman” kind of way. 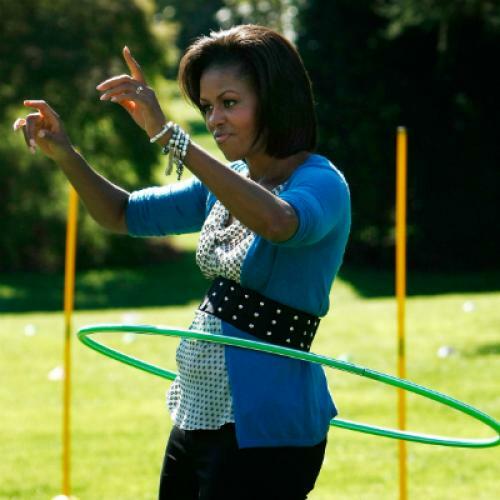 We dance around the point when we complain about how unfair it is that she needs to water down her professional accomplishments or pretend that she’s more interested in gardening and hula-hooping than health policy and constitutional law. The blunt truth is that Michelle Obama has to be mom-in-chief because there are voters who cannot abide the idea of a strong black woman in the White House. Remember 2008, when critics on the both the left and the right went after Michelle Obama for saying, “For the first time in my adult life, I am really proud of my country”? When the New Yorker ran a cover illustration of a Michelle with an afro and a machine gun slung across her back? When Rush Limbaugh frothed over the possibility that Michelle had used the word “whitey”? I don’t like him. Can’t stand to look at him. I don’t like his wife. She’s far from the first lady. It’s about time we get a first lady in there that acts like a first lady and looks like a first lady. You can think it’s ridiculous that people can’t handle the idea of a first lady with her own career or a black woman who is intimidatingly smart and accomplished while still recognizing that it would have been much tougher for Barack Obama to win the presidency if his wife hadn’t morphed into mom-in-chief. If you like President Obama, then you have to like Michelle Obama playing the role of proud mom to the entire U.S. Olympic basketball team. You have to like her dancing on iCarly. Because those warm fuzzy activities give her cover to go out on the stump as Obama’s most effective campaign surrogate. Michelle Obama has been the most active campaigner and advocate as first lady in my memory. She is certainly better on the trail than Hillary Clinton was in 1996, when her role in the failed health care reform effort exacerbated her image as a polarizing figure. Consider—we have a first lady who is a former hospital administrator, who gives a passionate and—to my mind—convincing defense of Obamacare, and yet during the debate over health reform, there was not a whiff of outrage about her connection to the issue. The best conservatives can do is say she has a large tush and complain that she nags them about eating healthier. Finally, let’s not undervalue the skill it takes to play the role of the nation’s mom. It is not easy. Michelle Obama is a whip-smart woman who can verbally spar with the best of them. Her husband has spent the past four years under sometimes vicious attack. And some part of her has to be constantly terrified about his physical safety, as well as the safety of her daughters. Yet with the exception of a rather thin-skinned interview with CBS this winter after the release of Jodi Kantor’s book about the Obama marriage, the first lady is always charming, warm, and gracious. Like Laura Bush, except with a billion more cameras trained on her. That takes incredible self-discipline and skill. Michelle Obama is an incredibly talented, accomplished woman, and I can’t wait to see what she does with her career after the Obamas leave the White House. But the main job of the mom-in-chief is to make sure that doesn’t happen for another four years.